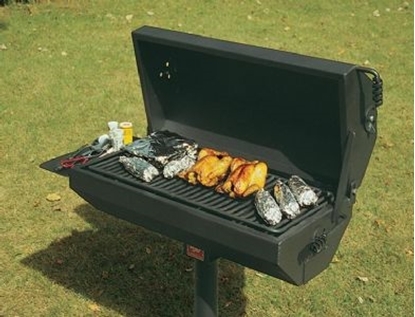 Covered Park BBQ grills keeps the fire box covered for safety and smoked cooking. Available in two generous sizes, these are mounted on a pedestal for easy placement. Park Tables practical covered grills can use charcoal or wood for a great cookout. Smoked BBQ ribs, chicken and hamburgers are everyone's favorite picnic meal. Covered grills are found at apartments and parks. Gather up your family and have a barbecue picnic this weekend.